Any avid crafter will tell you that one material that is great to work with, but is often forgotten about, are glass beads. When working with glass beads there are so many different projects that are easy to take on and also have some amazing results. 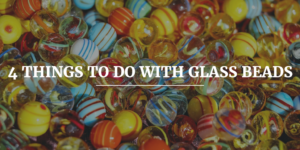 You may be surprised to know that glass beads are not only great for jewelry making crafts but can be used in so many different other days.